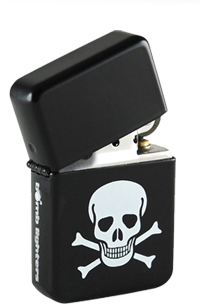 This design of lighter is a flat top windproof lighter, with full lifetime guarantee. If you or any of your customers ever have a problem – return it to us and we can replace the item free of charge. (Note- this warranty only includes the basic performance and build of the lighter. It doesn’t include paintwork been worn off or the fuel running out etc. The quality and durability is such that this is very rare to ever happen. Zippo is synonymous with this style of lighter, much like a Hoover is with the Vacuum Cleaner, but these lighters are not Zippo lighters but ‘Bomb Lighters’. This product is not connected to or affiliated in any way with Zippo and their trademark lighters. We do not supply Zippo lighters wholesale nor are these lighters endorsed by Zippo so it’s important when retailers sell the lighters, they do not use the Zippo name to describe them. The designs on these lighters are independently published and are not endorsed, authorised or affiliated with any known person, organisation, or character.